Getting rid of raccoons is not as easy as it seems. Once inside, these messy animals can wreak havoc in your home. If you reside in Westchester County, Katonah, Bedford, Bedford Hills, Mt. Kisco, Chappaqua, Armonk or Pleasantville, NY, you’re no stranger to seeing raccoons around your property. Use this raccoon fact guide to find out how they enter, the dangers they present and the raccoon deterrent measures you need to take to stop their entry. They enter from the soffit points on your roof. They enter from where the lower and upper roofs meet. The animals use their shoulders to open the aluminum or plastic soffit to enter the attic. The vents, located on the roof, enable proper circulation in the attic. Raccoons will damage aluminum or plastic vent covers to find warmth. The roof edge is where the eavestrough connects with the house. Melted snow and rain will go through this area, causing damage to it. Raccoons will chew rotten wood to enter the attic. Mother raccoons use the bottom of the chimney to nurse their newborns. They perceive chimneys as hollowed tree cavities. The cylindrical vents on the roof link to the house’s plumbing system. To install the plumbing vent, a hole is cut through the roof and covered with rubber matting. To enter the attic, raccoons will pull and chew the rubber mat. What Damages do Raccoons Cause? 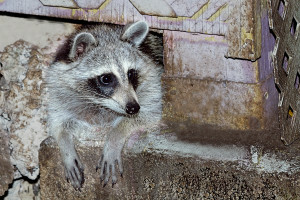 Raccoons tear holes in the attic to build a nest, resulting in damage to the insulation, pipe insulation, drywall, air ducts and the HVAC system. It is important to call raccoon pest control, as they are known to chew through electrical wiring and wood. Delaying repairs can result in water damage, fire damage and mold growth. Raccoons have powerful claws which they use to remove soffits, fascia and shingles. They can squeeze through a four to six-inch opening, leaving a gaping hole in your roof. Contact Pinnacle Wildlife Control for raccoon control and removal. Raccoon feces and urine carry germs. If they bite or scratch you, they can infect you with various diseases such as rabies, salmonella, roundworm and leptospirosis. They can also bring in parasites such as fleas and mites. You can set raccoon traps or contact a raccoon removal service. Block access by filling in cervices and holes around the house, including attic vents, seams along the roof and baseboards and chimneys. Set up raccoon traps or spray chemical repellents. Contact Pinnacle Wildlife Control for raccoon pest control, serving areas of Westchester County, Katonah, Bedford, Bedford Hills, Mt. Kisco, Chappaqua, Armonk and Pleasantville, NY.